The Gourmet Rubber Stamps Design Team members have a wonderfully refreshing color challenge to share with you today! 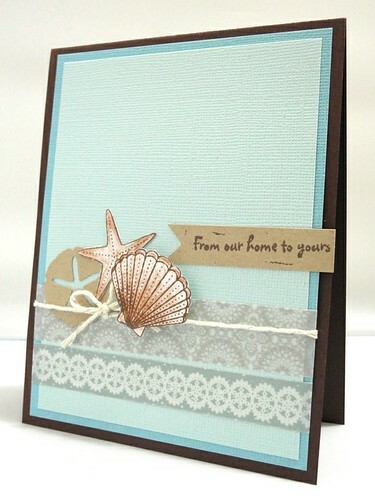 I used the beautiful shell and starfish from the Pack Your Bags set and pulled the sentiment from the Holiday Lane set. 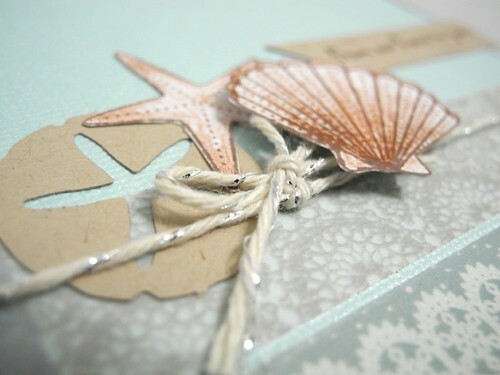 I love the beachy feel to this one! I added some pretty tapes and some gorgeous tinsel twine from The Twinery to finish it off. I do hope you join us in being inspired by these colors and link up your creation on the Gourmet Rubber Stamps Facebook Page! We love to see what you do! Here are the links to check out the rest of the DT work inspired by these fabulous colors! Lovely card...love the difference between the simpleness of the sand dollar next to the stamped and coloured other shells. Beautiful!! I love the colors!! Gorgeous! I love the design and beachy feel. Just GORGEOUS! I love how you did the beach theme for the holidays. Great card! Beautiful! I love anything to do with the beach.